Drone tour: Here’s a video to excite and inspire those of you who will be going to Santorini this summer — or possibly sometime in the future. Created by NPro+ Aerial Production, the two-and-a-half minute film will take you on an exhilarating aerial tour of the western side of Santorini, renowned for the picturesque villages that cling to the peaks of rugged caldera cliffs towering nearly 1,000 feet (300 meters) above the Aegean Sea. Although dozens of drone videos of Santorini are available for online viewing, I particularly like NPro+’s Santorini from the Sky because it starts with a superb view of Agios Theodori, the church that has been pictured on countless Santorini postcards, posters and travel guides. 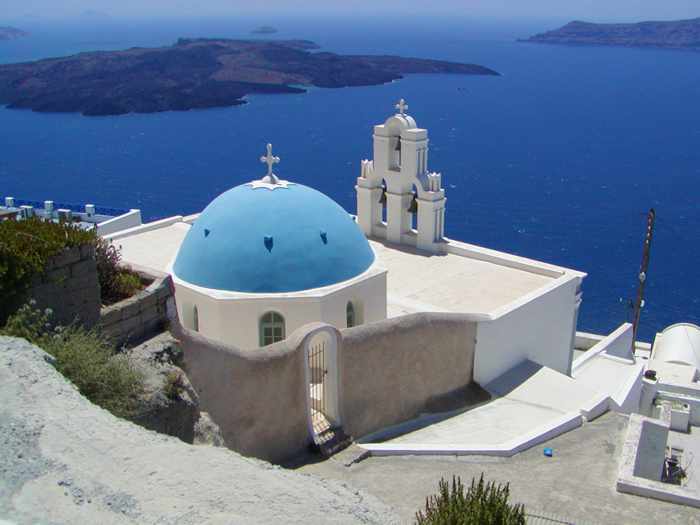 Instantly recognizable by its shiny blue dome and brilliant white belltower overlooking the volcano island of Nea Kameni, Agios Theodori church was the first fascinating sight we saw moments after arriving at our hotel in Firostefani village on our first visit to Santorini in 2004. The video goes on to show other remarkable scenes that amazed us throughout that holiday, including views of four clifftop villages — Fira, Firostefani, Imerovigli and Oia — and beautiful Amoudi Bay below Oia. Of course, the film also shows some of the sensational sunsets for which Santorini is famous around the world. Scenes from some of the shop-lined streets in the heart of Fira, and from a few of its many cliffside cocktail bars and cafes, also made me feel like I was right back on the island experiencing it in person all over again. The only thing I didn’t like was the brief view of tourists riding donkeys on the path that winds down the cliff from Fira to the cruise ship tender port. Click here to read why you shouldn’t take a donkey ride if you visit Santorini. Even if you’ve never been to Santorini, you’ve probably seen Agios Theodori church — it has been pictured on scores of postcards, posters and travel guides. Located in Firostefani village, it was the first impressive sight we saw on our first visit to Santorini back in 2004. There’s a great view of the church, and the Nea Kameni volcano island (upper left), at the beginning of the Santorini from the Sky video I posted above.